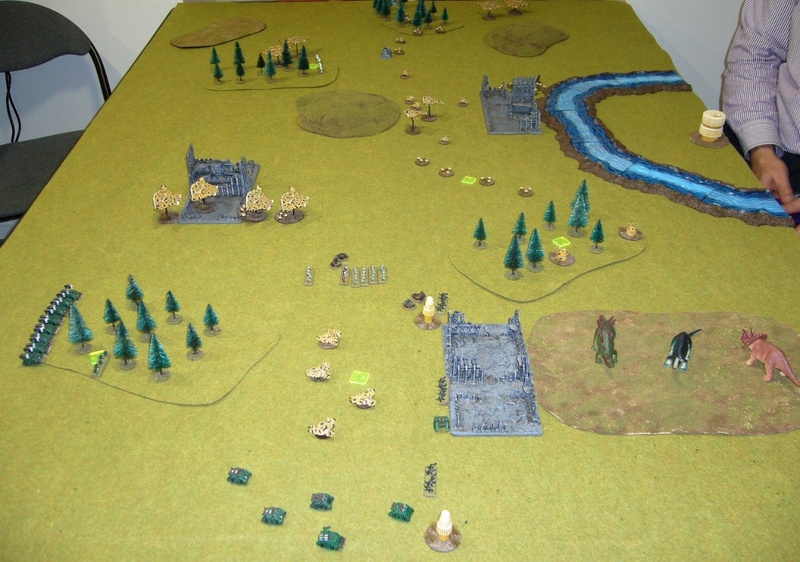 An interesting game two nights ago where I used my Marines and Andrew his Tau, and both armies had a fair amount of air assault ability. 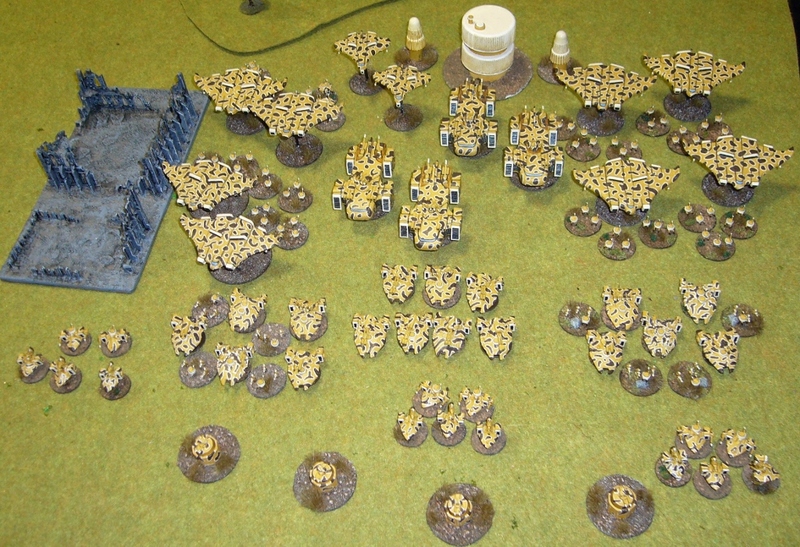 Andrew Used a Tau list with 4 formations of Tigershark gunships carrying drones, plus super heavy tanks, more tanks, and recon. Here's the setup. As the Marines I chose deployment and ended up giving the skimmer heavy Tau quite a nice defensive deployment area behind a river. 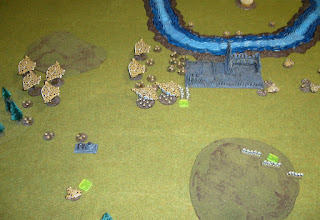 I figured I didn't want this in my deployment zone as it is impassable to vehicles except at one point near the ruins, and the problems it would cause me would exceed the benefit it would give the Tau by having it - maybe! 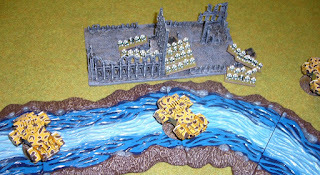 The river is impassable to vehicles (though not all the Tau vehicles which are skimmers), and dangerous terrain for infantry. 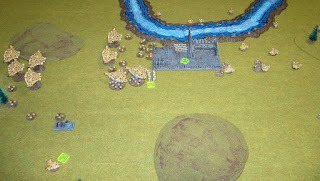 The two Tau Take and Hold objectives are closest to the camera, near my main deployment area. 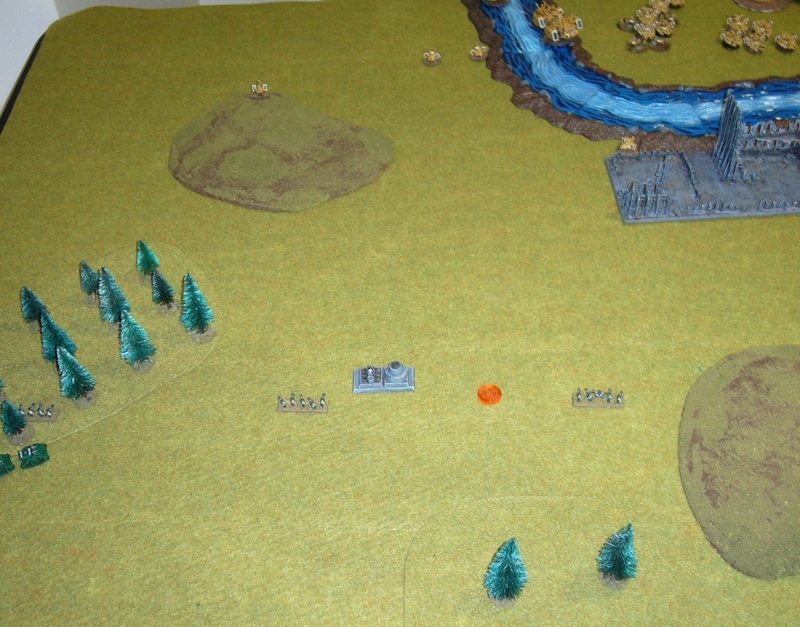 The two Marine Take and Hold objectives are mirrored on the other side of the battlefield away from the camera. 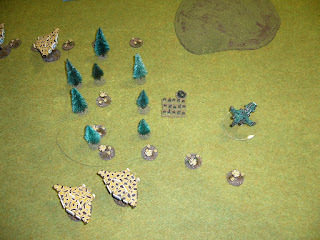 The Tau excel at long range fire, so somehow I'm going to have to close and destroy them before they shoot me to pieces. 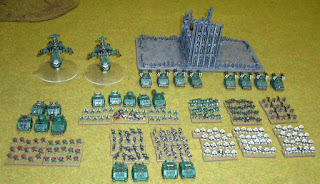 And at the same time if I mess up the assault my assault troops will be gunned down very quickly. 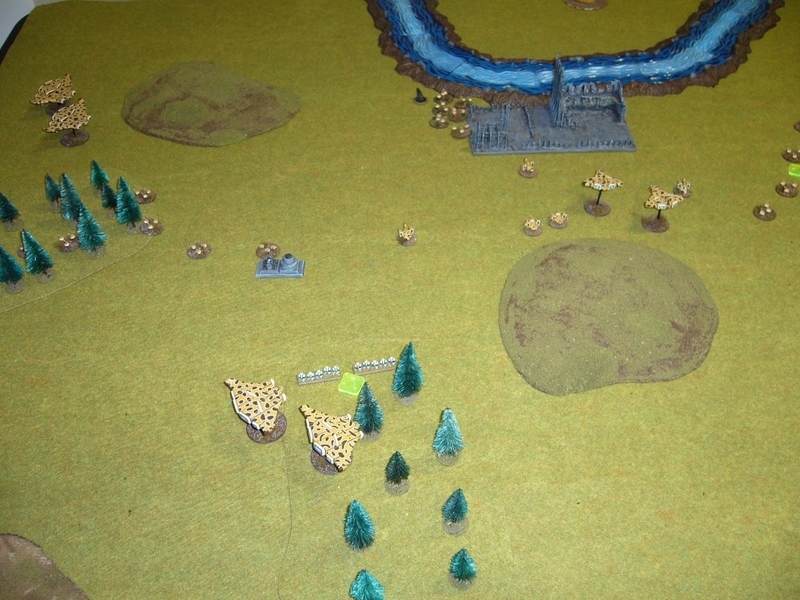 I have a defensive position near one of the plantations, with both formations of Whirlwinds protected by a Tactical and Scout formation. My Scouts on my left flank are aiming to distract and slow the Tau and draw their forces that way. 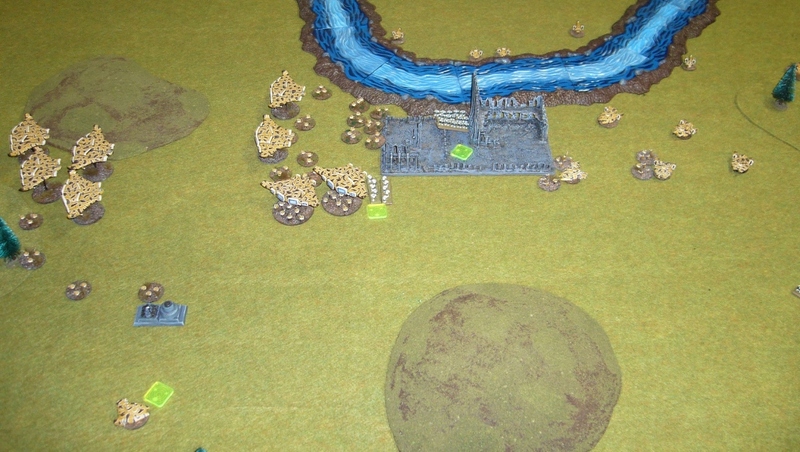 The Tau deployment making full use of the river. Marines win Strategy Roll and I make the Tau move first. They advance a Recon formation to spot for the Scorpionfish tanks, but the Recon kills the Scout squad in range and so the Scorpionfish have to move and fire directly. Oops. Andrew isn't happy with this opening error on his part. My Tactical formation moves up and eliminates the Recon formation in a firefight. 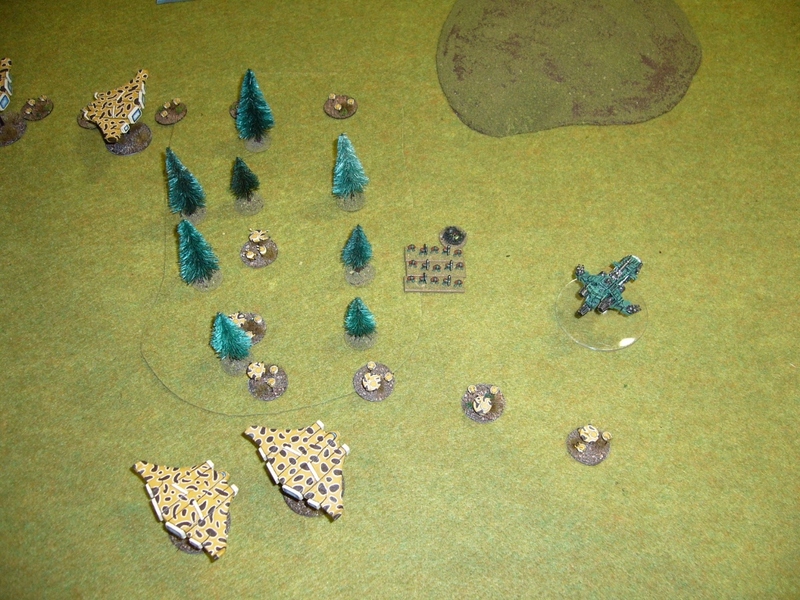 Tau Tigersharks and Drones descend upon my left flank wiping out my Scouts and also destroying a reinforcing Devastator formation that had just wiped out another Recon formation. Tau advance strongly on the left, and their Hammerhead Tanks destroy the landed Thunderhawk. Tau make their point and take the left side of the board decisively. I decline to fly on with my second Thunderhawk given all the AA and waiting interceptors. I teleport all three Terminator formations near the two Scorpionfish formations. 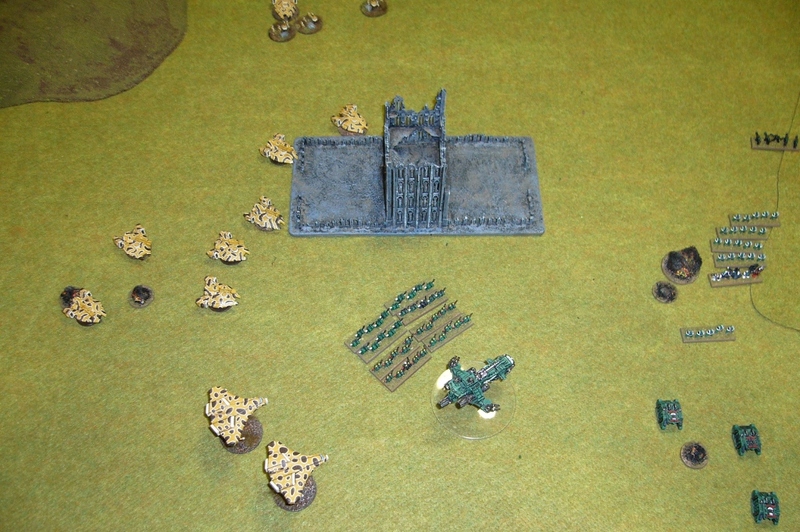 The Captain's formation takes two blastmarkers and the Chaplain's formation one blastmarker. This is quite a risky move, as I will be relying on firefight with Terminators rather than close assault given the Tau vehicles are skimmers. I'm also going in disordered against well armoured skimmers (5+ deflector and 5+ reinforced armour). 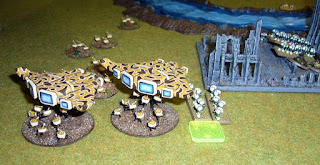 Fortunately the Tau only have a firefight of 6+. 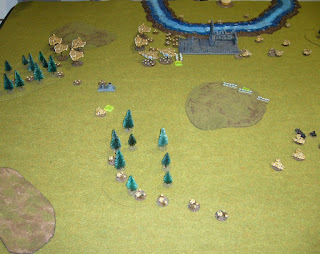 First assault is two formations (one the Captain ordering the combined assault), supported by the third formation. It goes in my favour and the Tau formation is wiped out. I retain initiative and the Chaplains formation follows up with another firefight engagement against the second Scorpionfish formation. Support is provided by the other two Terminator formations which have consolidated into support range after the first firefight. Another victory and all Scorpionfish and the Tau Supreme Commander are eliminated for loss of no Terminators! Pretty devastating for the Tau. 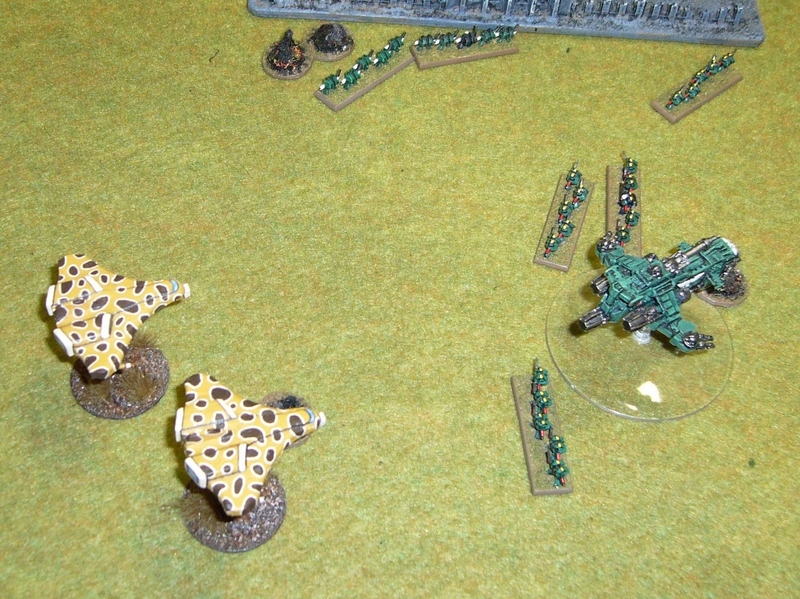 Tau Hammerheads respond, and wipe out all the vehicles from my Supreme Commanders Formation. 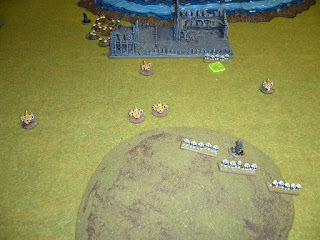 Then Tau aim for revenge on my Terminators throwing formation after formation of fire at them. 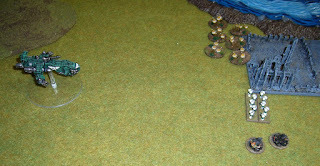 Fortunately the Terminators have Thick Rear Armour ability so the usual Tau crossfire trick doesn't help them. Still weight of fire takes its toll and soon Terminators begin to fall. 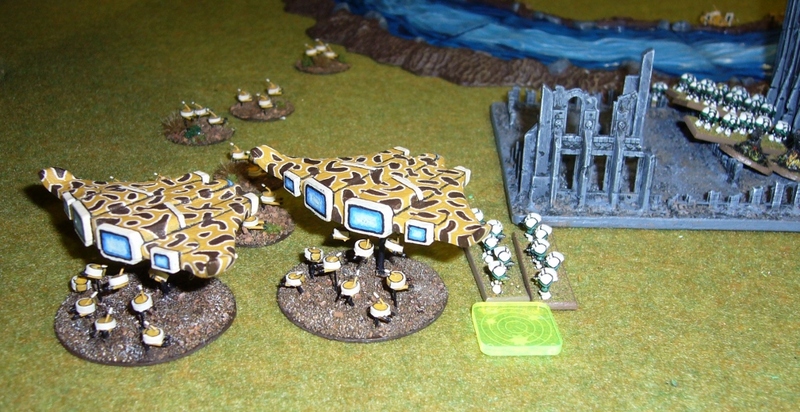 My Whirlwinds keep firing barrages at Tau formations keeping up attrition on them. 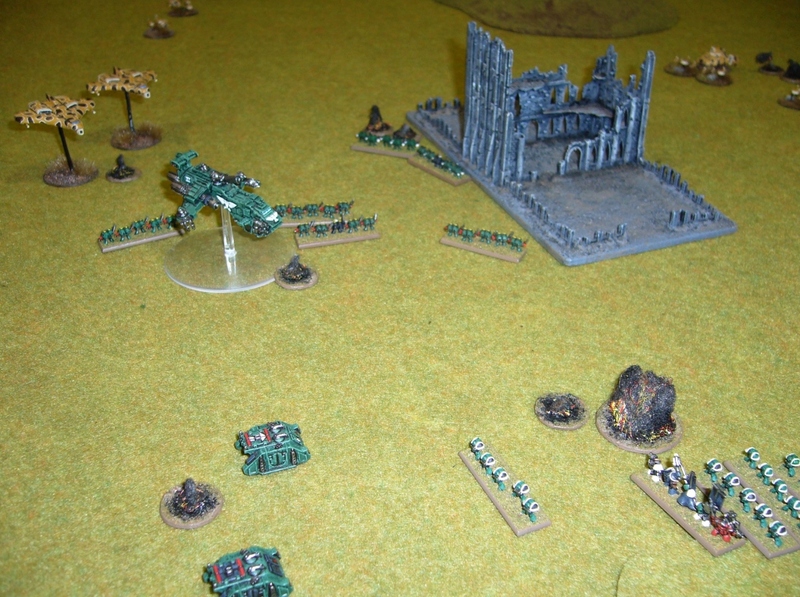 Time for another air assault, here comes the Thunderhawk with Assault Marines, flying through heavy flak and dodging interceptors to emerge unscathed. The Assault marines destroy all but one Hammerhead with their engage action, with the two Chaplains Inspiring ability urging them on. Two Assault Squads are lost. 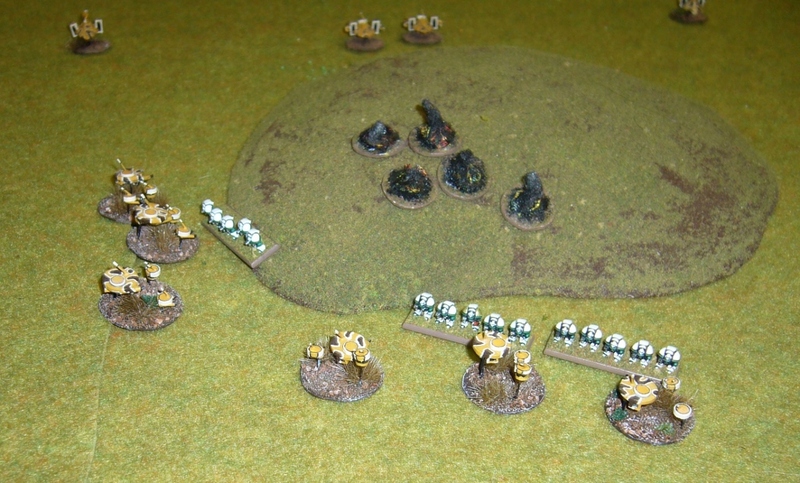 Terminators continue to take much fire and two formations are broken by now. One formation of Terminators is wiped out, and the other two are broken. End of turn before rallying. After rallying, all Marine formations rally, though not all Tau. 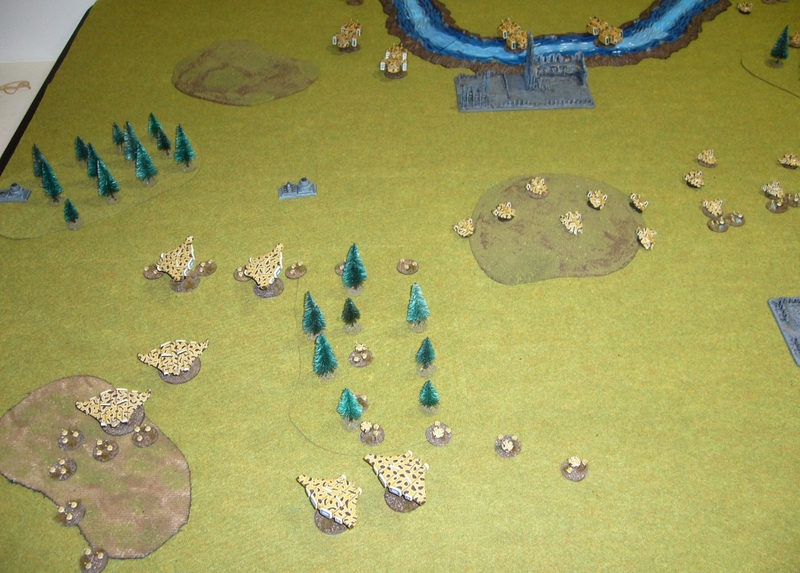 Tau win Strategy Roll, but fail to activate with their Firewarriors who just carry out a shoot action. 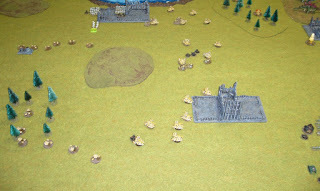 This is still enough to wipe out the two remaining stands of one Assault formation though. 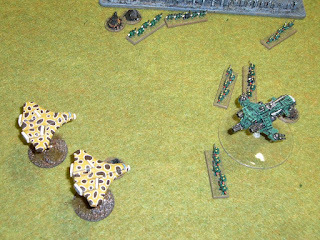 My Thunderhawk flies on and strafes and breaks a gun drone formation, before the Tau interceptors get a chance to do anything. 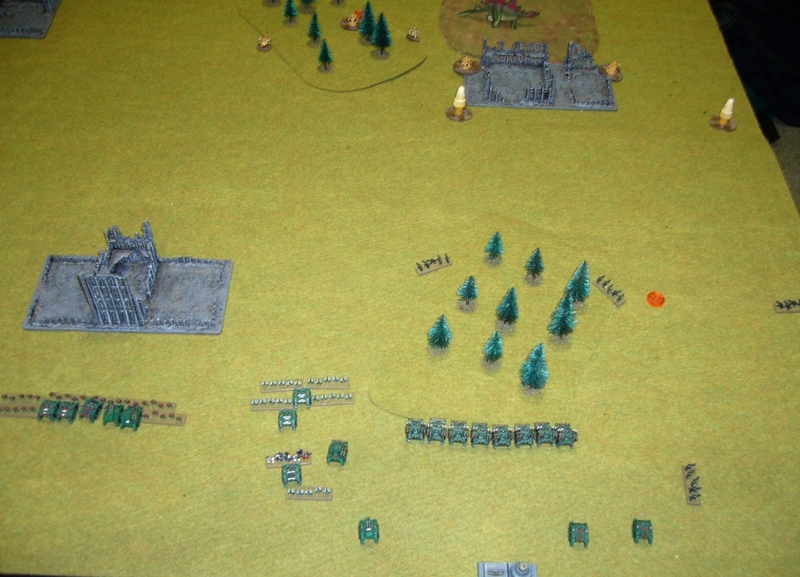 And my second Assault Marine formation engages and destroys the Firewarrior formation for no loss. 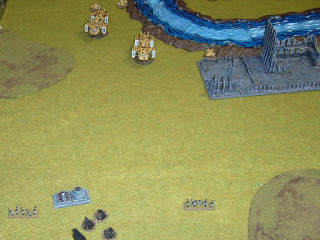 The Tau break one of the rallied Terminator formations and concentrate on the second one. My Terminators engage and destroy a gun drone formation before they are broken in turn. 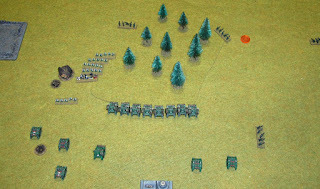 But the Tau are out of activations except for Bombers and Fighters, and on my right flank my Marine units which had been hunkered down in cover, now surge forward and claim the Tau Take and Hold objectives. The Tau cannot stop them all. 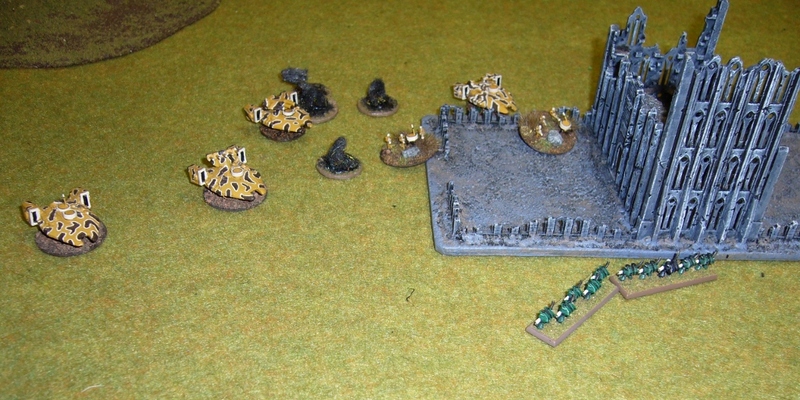 Tau hold my Take and Hold objectives on the other flank. Game over. 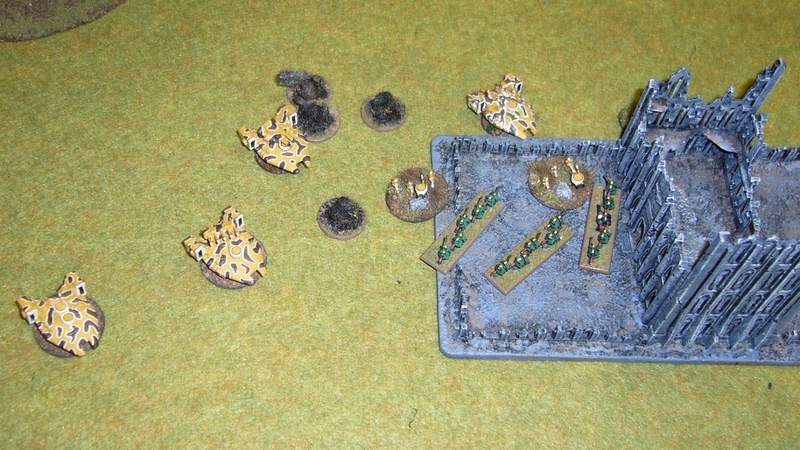 Win to Marines 2-1 on Victory Conditions, with Take and Hold and Break Their Spirit (the Scorpionfish formation destroyed), to Take and Hold Victory Condition for the Tau. Well I didn't like my chances at the start of the game, but the Emperor smiled upon the forces of righteousness. 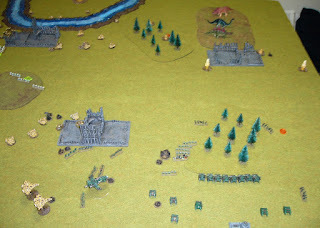 The plan worked, which was to hit some priority targets hard with assault troops, and then let the Tau exhaust themselves on two Marine hard points - the Terminators and defences around the Whirlwind artillery park. 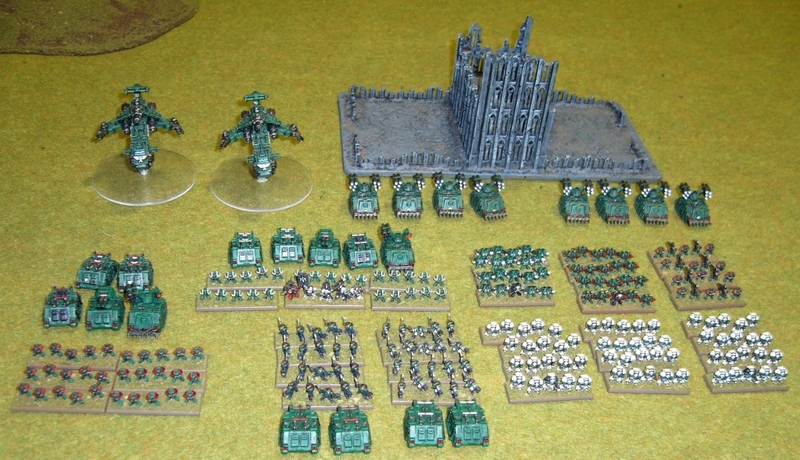 I was relying on Marine armour and rallying ability to outlast the Tau in a battle of attrition once the main Tau power units were weakened/destroyed, and that's how it panned out. 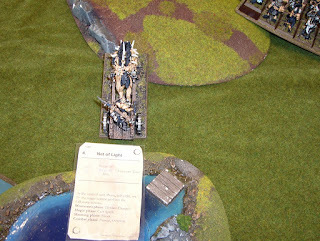 However, had the Terminators lost their engage action it would have been a different story. It would have been preferable to suppress the Scorpionfish first of course but in this instance I didn't have time and things were balanced too finely so I felt I had to take the risk! 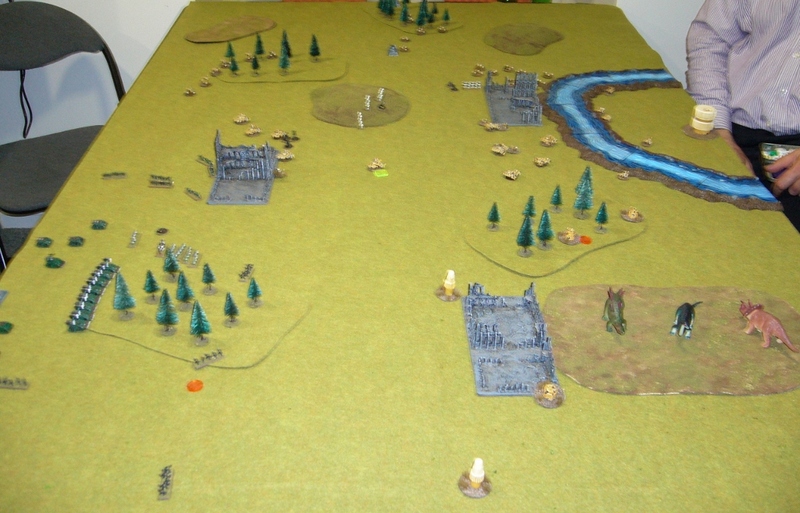 As usual an interesting tactical challenge, and also as usual very different in nature to that of any other recent game given the diversity of forces you can field in Epic! 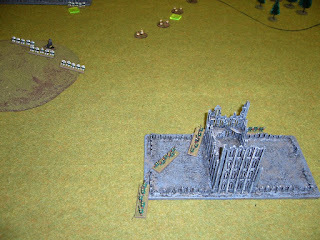 After Games Workshop killed off Warhammer there was much wailing and invocation of curses. 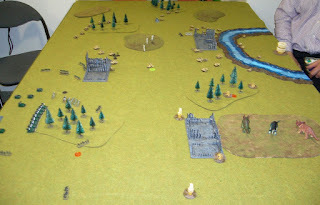 Some Warhammer refugees went to Kings of War by Mantic Games, as you can see in my previous initial review and tournament reports. 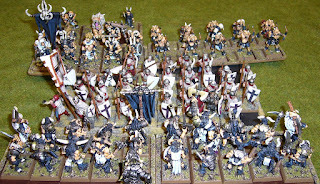 I regard Kings of War as a fine system. 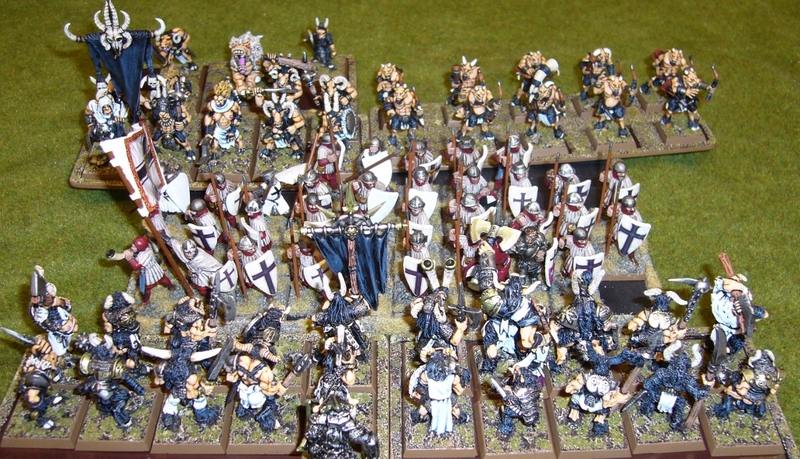 Others around the world pooled their efforts to make a copyright free version of rules for their Warhammer Armies - and 9th Age was born. I haven't followed the development process at all, but 9th Age appears to have been a herculean effort of revision and updating. The most impressive part of it to me is the successful international collaboration to pull off such a task in such a short time frame. 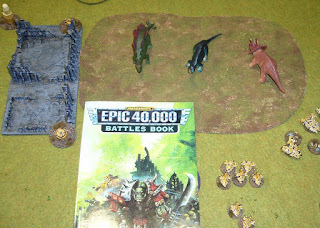 It's what the Epic community did with the Net Epic Armageddon project, and similar things have happened with other GW games, so there was a proof of concept that the idea is workable. Local Warhammer players here seem to want to play 9th Age, so even though I'm happy with Kings of War I agreed to give it a try. My "Beast Herds" faced up to Mike's "Empire of Sonnstahl" in a 2500 point game last Sunday. 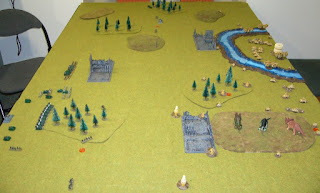 I was impressed looking at the new army list and rules. These are produced to a high standard, well edited and much thought given to balance. 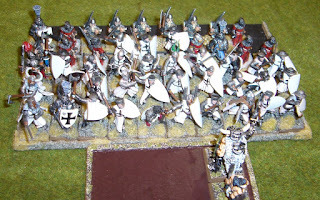 When I say balance, I mean that each unit in an army appears much more viable in some role and worth taking. 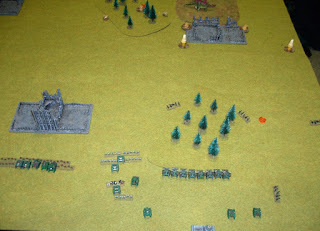 In 8th edition the points balancing was off by quite a bit, and so unfortunately many cool models tended to sit in the box and were only rarely used. 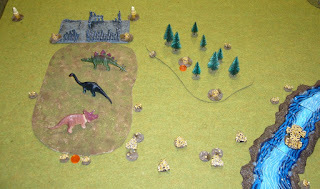 For example the Jabberwocky (Jabberslythe) was 275 points in 8th and virtually never taken. It is 125 points in 9th (and also has two optional upgrades) and so it is not a dramatic act of self-sabotage to take one any more. This applies across the lists, the balancing is much better. That doesn't mean everything will be perfect of course, but the margins of error are much less problematic. In addition the rules have some nice new features and problems solved. 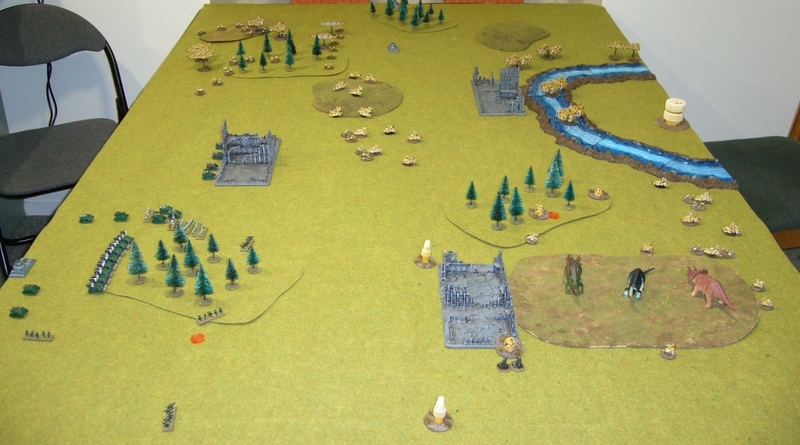 For a quick look at some differences in the core rules, this you tube review is helpful. Here's the game at the end of my first move, with beastmen charging towards the Empire lines. 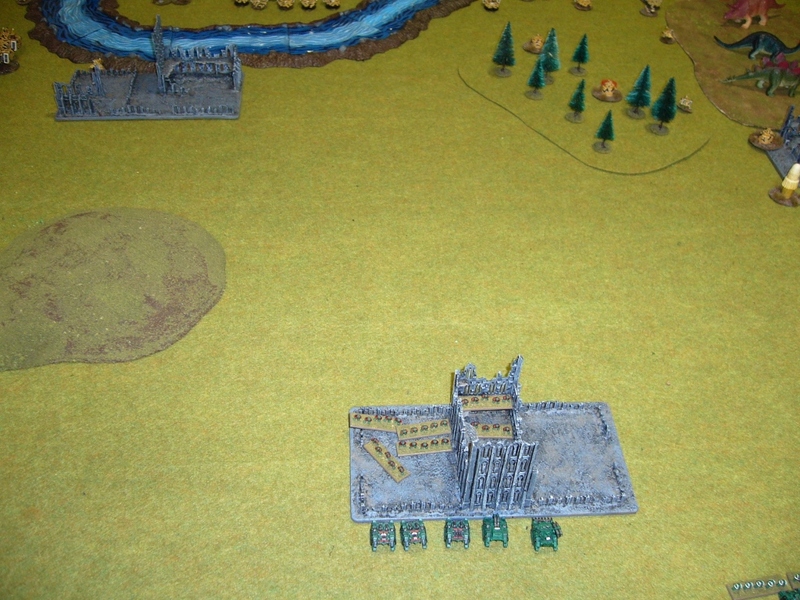 I have two Mongrel Raider units and one Wildhorn unit ambushing. View from Mike's side of table. Giant, Razortusk and Jabberwocky charge up the left flank. 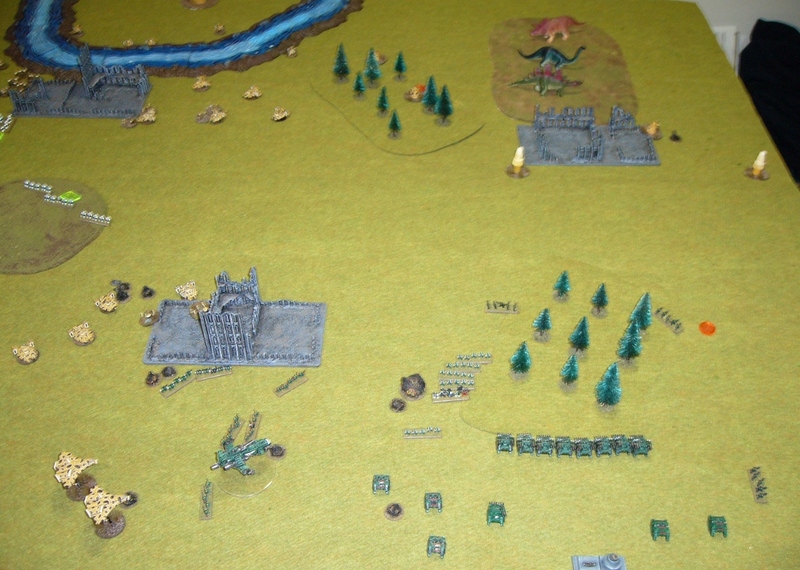 Empire moves to counter and shoots dead the Jabberwocky with cannon and crossbow. First Razortusk charges into crossbowmen, and rest of Beastmen position themselves for charge. 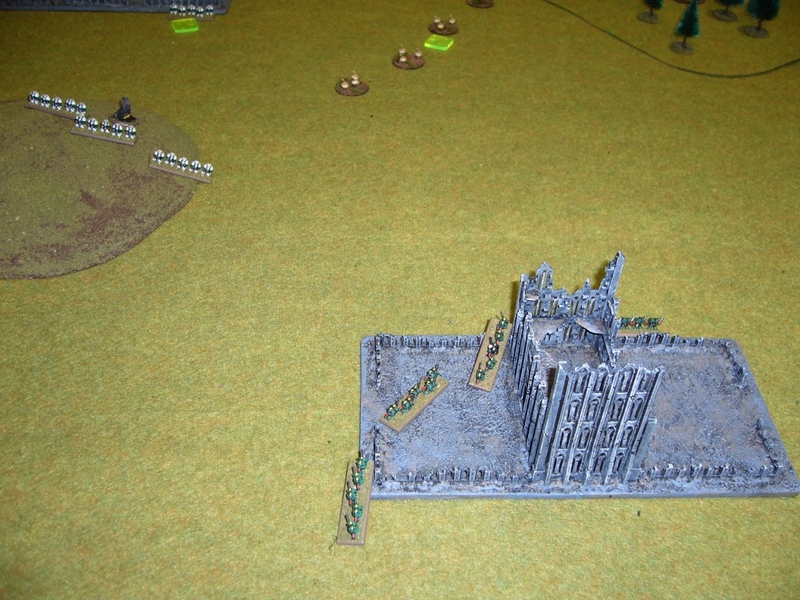 Ambushing Mongrel herds arrive behind the Empire line. My Giant is hit by a cannon and loses two wounds, four remaining. Charges go in. 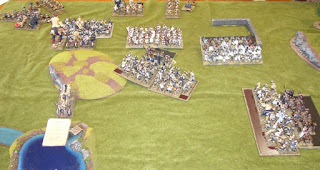 My Wildhorns on the right are hit by a long distance charge by Flagellants in addition to a detachment. 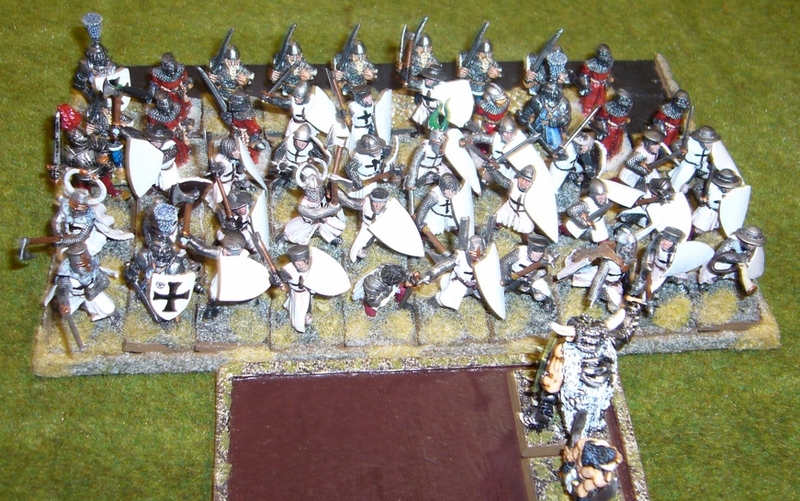 Wildhorns wipe out the detachment and turn to face the Flagellents exposing their flank to the swordsmen. 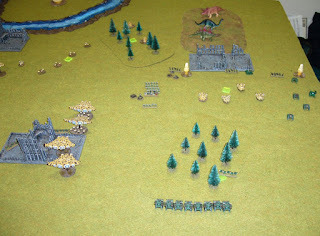 Second Razortusk joins the first in fighting the crossbowmen. 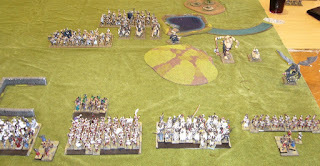 Two chariots and Giant hit the Greatswords. I read the wrong chart for the giant, and he squashes a single model when he actually should have done 2D6 strength 6 hits! Aaagh! Yes swing with club for giants does 2D6 hits rather than 1D6 hits. Giants are not only cheaper but hit harder, yay. Last Razortusk chariot is stuck by a spell. Flagellants and Wildhorns pummel each other. 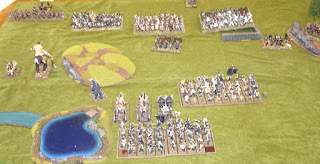 My Longhorns defeat the detachment in front of them and overrun into the spearmen. Spearmen slaughter many of the Longhorns and would probably win the fight, thanks to some Empire marshal abilities, but my ambushing Mongrels and Wildhorn herd hit in them in the rear and help out. 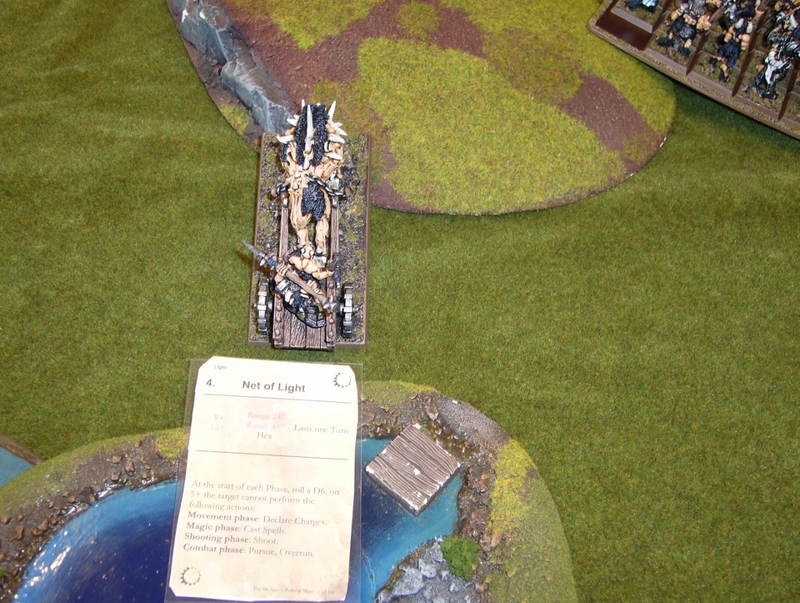 The Longhorns defending the Beastlord have stubborn ability which is very useful. 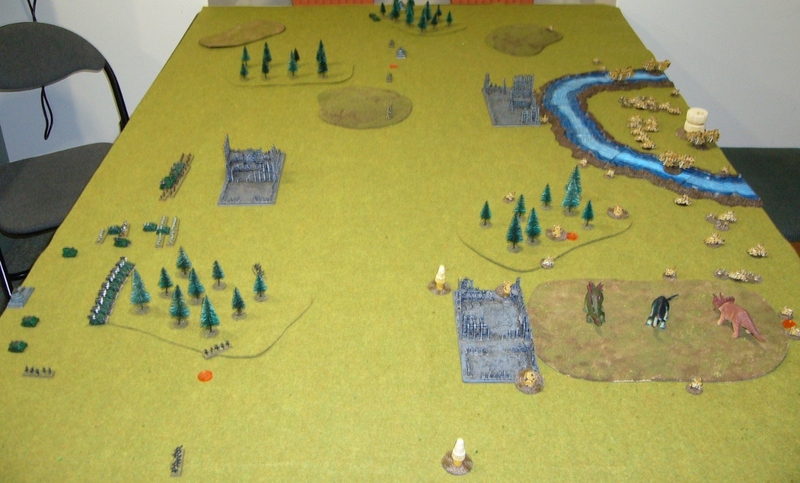 On the left, my forces clean up the crossbowmen and cannon. 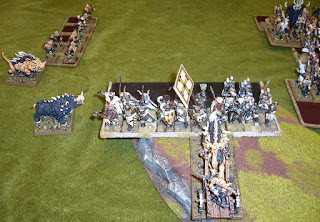 On the right the remains of my Wildhorns are charged by the Swordsmen. 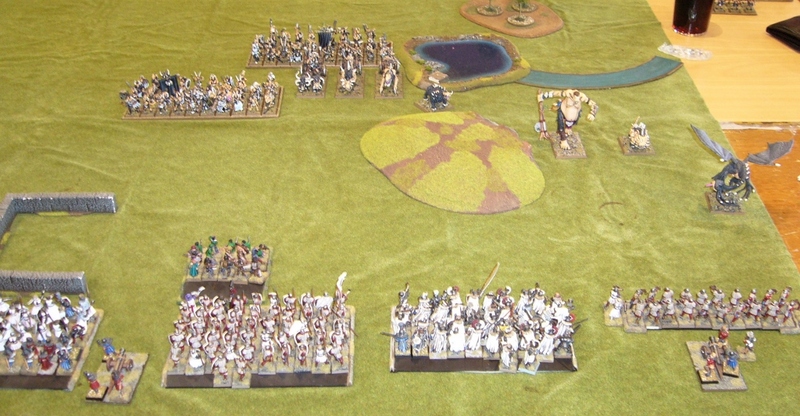 The Greatswords kill the giant and chariots, and are then charged by the next Razortusk chariot. 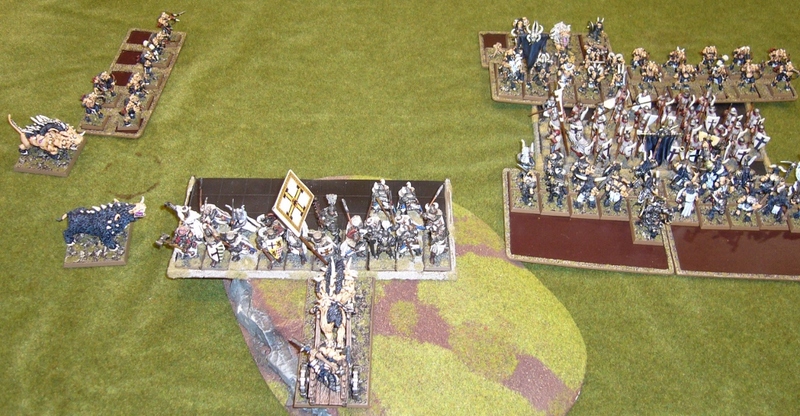 Chariot gets lucky and runs down the Greatswords. 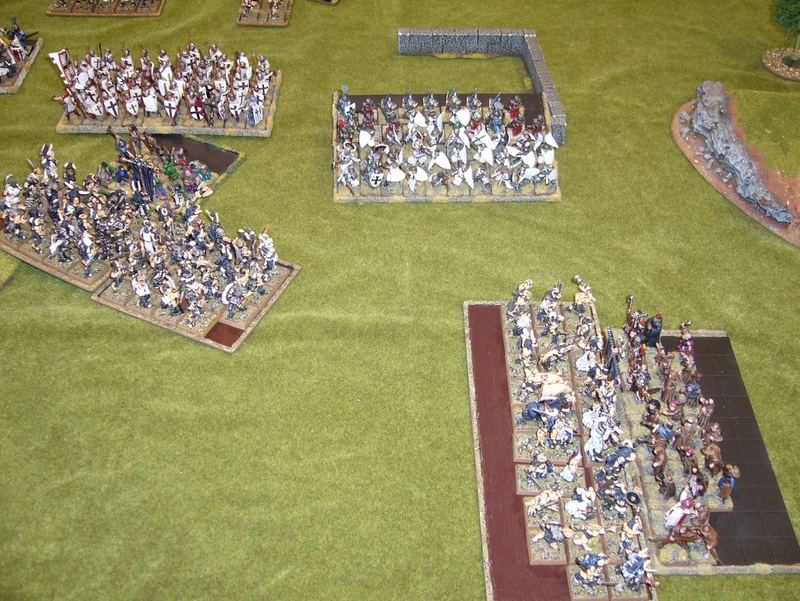 With Spearmen and Greatswords destroyed only the Swordsmen are still fighting for the Empire and Mike concedes. 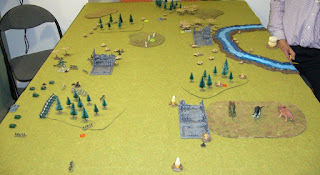 Kudos to the 9th Age team for pulling together this huge project so quickly. This seems like a superior edition of 8th edition, with far more army builds feasible and a range of new tactics and combinations to explore. Highly recommended if you like the Warhammer rules concepts and Warhammer world.